These Bali Star Burst Fashion Earrings are hand made in Indonesia. 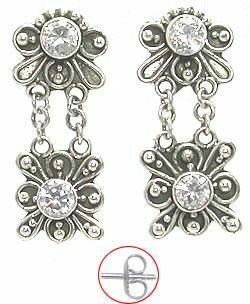 These unique earrings have two crystal jewels on intricately shaped sterling silver backs. The sun burst detail makes these earrings fun as well as fashionable. Not sure what to wear in your belly piercing, check out this matching Star Burst Belly Button Ring.